Before there were Fighting Falcons in the desert, there were Sabres in the sky. 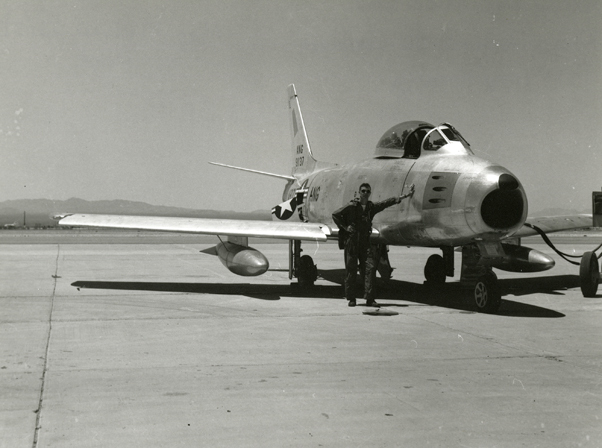 In this photograph, taken in the late-1950s, a pilot stands by his F-86A Sabre, the first jet in what was then the 152nd Interceptor Squadron’s inventory. TUCSON, Ariz. — On any given day, F-16 Fighting Falcons zip through the southern Arizona skies – their pilots perfecting their skills – showcasing military readiness thousands of feet above the desert. It’s a reoccurring scene similar to what an observer might have experienced in 1956 – the birth year of what is now the 162nd Wing – when the F-86A Sabre and the F-100 Super Sabre epitomized air power for Arizona and America. But today, some of the Fighting Falcons are now manned by student-pilots of allied nations, eager to showcase their abilities under the expert guidance of instructor pilots. The seemingly never-ending demand for global intelligence and surveillance initiatives that only a remotely piloted aircraft (RPA) can provide keep the 214th Reconnaissance Group busy. And ten miles to the east, the 162nd Wing keeps a detachment at Davis-Monthan Air Force Base, providing support for visiting pilots while fulfilling the traditional “Minuteman” role to state and country by means of an alert detachment. Rare is it that modern-day organizations can have ties to its past, or even its very beginnings. The 162nd Wing, however, can make that claim as its founding commander, retired Maj. Gen. Donald E. Morris, still calls Tucson home. 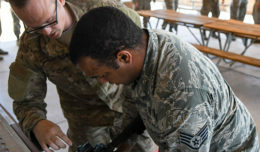 Morris was a 31-year-old major based at Luke Air Force Base in Glendale, Ariz., when he, along with 29 Airmen, made their way south to a dirt field near the Tucson Airport Authority to form the 152nd Interceptor Squadron. 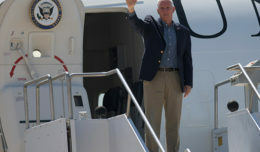 He would go on to serve as the unit’s commander for 15 years, later earning his first star as the commanding general for the Arizona National Guard, culminating with high-level positions within the Air Force Southern Command and Europe Command before his retirement in 1983. “This wing is really our very own family business,” said Airman 1st Class Christian Ferreira, a maintenance planning and scheduling specialist, referring to how he currently serves with his brother, Greg, his sister, Vanessa, his father Joseph and his uncle Daniel. 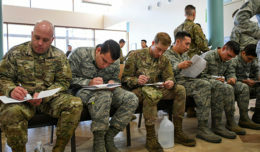 The more permanent nature of Air National Guard personnel allows for greater knowledge of all things specific to the wing, especially in the maintenance field. As 2016 will be a year of recognition and reflection at the wing, its Guard Airmen will proceed forth with a “Fly, Fight and Win” mentality – supporting each other, upholding their oaths, maintaining assets and resources and employing military hardware.